Anastasia Davydova, the name is pronounced by the Russians with boast as she is a5-timewinner of swimming in Olympics. This conquering lady was born in Russia’s Moscow on 2 February 1983. She won a gold medal in 2004 Summer Olympics held in Athens and 2008 Summer Olympics in Beijing. Later she was one of the team members of the gold medal-winning team of Russia in the years of 2004, 2008 and 2012 consecutively. Even, after being such a popular sports person, Anastasia Davydova obtains fervour for tattoos that is totally proved by her back which is completely tattooed by the trails of butterflies. Multicolour butterfly tattoos are perhaps bearing the eventful life of this swimming star. It also portrays the victory of woman power which is totally unveiled by Anastasia Davydova. Her triumphs have gotten the full-fledged exploration through these tattoos as well. 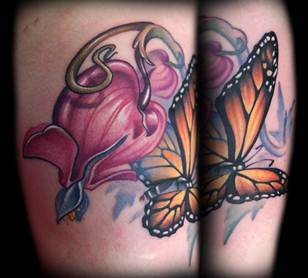 Butterflies carry the signets of spiritual beliefs, love and emotional aspects also. Naturally butterfly tattoos also do the same. It symbolises rebirth and Christ’s Resurrection also that naturally shows the heavenly perspectives of such tattoos.